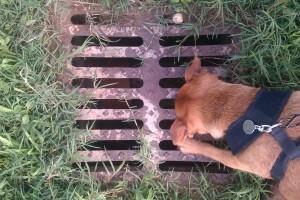 Jack and I have found a drain monster. We were walking in our favourite place in the park and Jack as you know is banned from being off lead here after getting badly bitten, and after getting stuck down a pipe. So he’s wandering about on the long lead and started investigating a drain cover he’d found in the grass. I tugged him to follow me but he wouldn’t so I went over to see what he’d found. As I approached I heard a thud, like a heavy body hitting the floor but with a wet sound, and then nothing. I looked down the drain but could see nothing. Jack was scrabbling about like mad so obviously something was done there, and I decided it was probably the rat or whatever it was that bit him the other week. I stood there a little while letting Jack hone his hunting instincts and suddenly I heard a mooing. Yeah, just like a cow. Right, imagine a cow, with it’s mouth closed, mooning dejectedly. That’s what it was like. No I haven’t been smoking or drinking anything! Yet another item has failed on me, this time my new 24-105 Canon L series lens that I bought last year from Portus Digital. I’m so frustrated with these constant problems at the moment. The 17-40 lens is the only one I have left working now that is of any general use on the streets of Venice. 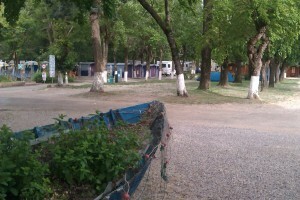 I’d found Camping Rialto on the ACSI map and it was €21 a night but being an ACSI member it was only €16. Leccie, showers, laundry and a bus stop right outside the gates, what more could you ask for? The reception staff were really helpful and friendly with great English and although the pitches are typically much smaller than British ones there was no problem at all. It’s lined with trees everywhere and screened from the road by more trees and bushes. All the services were immaculate and they used standard HU sockets so no adaptor needed. They sell bus tickets at reception so it was easy to prepare for nights in Venice and although I never used their onsite bar it was pretty busy each evening and everyone sounded like they were having a fun time. A nice site and not charging a rip-off price. I like it. Things got hairy here, for what reason I have no idea but everyone was asked to leave the car park, and when I parked along the road I got 11 hooters in one day! That’s the worst anywhere. Public holiday maybe? 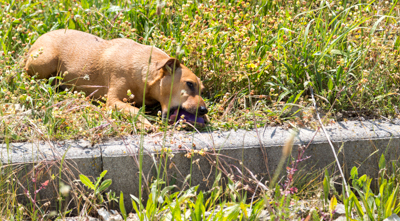 I have no idea but I came out to Jesolo anyway and it’s very relaxing here, especially for Jack who loves his purple Kong when it’s packed with misfits lol He sat in the grass for a few hours happily chewing away totally oblivious to all the spiders and god knows what that were crawling all over him. had a private, armed security guard on the door. We walked this each day as it was about 3-4 miles long so was good exercise. Whilst I was there a parade of cars and vans filled with football fans waving flags and banners and tooting their horns constantly drove up the main street. 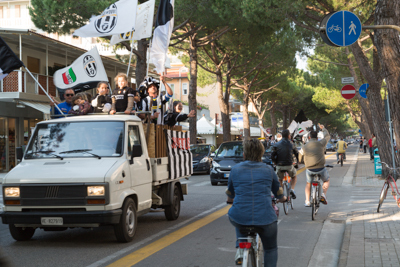 I think they were Juventus fans and everyone thought it was fun. Except me. Football hating grump that I am. The spectacle was fun though. 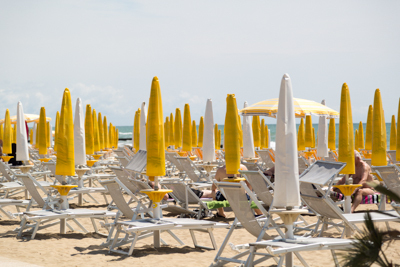 There’s more photos of Jesolo here if you’d like to see them. I’ve been using Opera browser now for about 20 years or so. I’ve never liked Internet Explorer, Netscape was awful, I can not get used to Firefox and it often has lots of bugs and problems, and Chrome is just plain nasty. So I was amazed last year when Opera said they had done a study and no users wished to have bookmarks! What!? Bollox! Everyone I know uses bookmarks, I don’t know anyone who doesn’t! Now one of the main things I like about Opera is their speed dial. It’s a page where you have small thumbnails of your most used websites. Click on one to open it, so it’s just like a quick and pictorial bookmarks of your favourite sites. 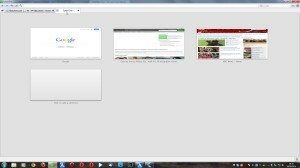 as you can see in the screenshot here has the speed dial page, although it is not customisable as Opera’s is. The resolution is not great so it looks blurred too, which kind of sums Midori up for me, it sort of feels ‘blurred’, or half done. As if they forgot to finish it off. Despite them saying on their website that it is blazing fast it’s not, in fact it’s very slow, so it’s second choice at the moment. 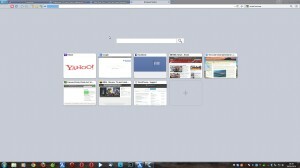 Avantbrowser is the other and instantly the speed dial, which holds 5 instead of three columns looks better. The whole browser feels better and it is quite fast. It’s brilliant for video playback and has a button to easily download any video you’re watching. It’s got ad blocker as Opera had and you can also quickly zoom the page in and out if you wish. Like anything new I have to get used to it but I’m liking it already so I’m moving over to trying to use it all the time now.